This is a sponsored conversation written by me on behalf of DaySpring. The opinions and text are all mine. With wedding season reaching its peak next month, I am probably not the only one this summer who is going through the ordeal of finding that perfect wedding present for a loved one. This past month my sister in-law married her high school sweetheart who also happened to be boy next door. Their love story is adorable and I wanted to give them something equally cute and personalized. I decided to put together a gift basket and was very relieved to find out that Walmart has a new line of Christian Celebrations products that happens to reflect their relationship to a T.
Included in the gift basket are different items that reflect their new life together in their new home. I also created little gift tags that have a short and fun poem to go along with each item. It’s so easy to recreate this basket! All you have to do is purchase Mr. and Mrs. matching mugs, stationery products, a home decor item, and sparkling cider… because who doesn’t enjoy a glass of bubbly! 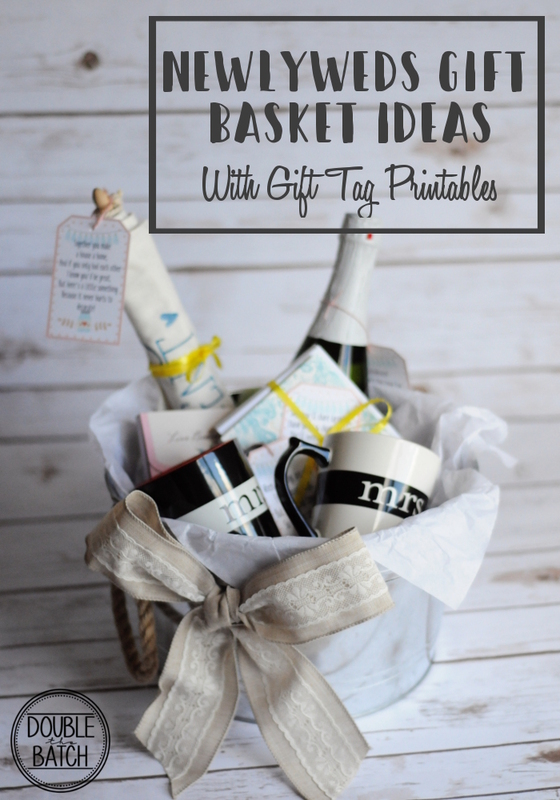 Download and print out the gift tags (link at the bottom of this post) and place all the items in an adorable little basket or tin. To make your basket even easier, head to Walmart and you can purchase all of these items in one aisle! I even purchased the tin an aisle or two down. Walmart’s new collection of Christian Celebrations products are great for newlyweds as there are a number of different home decor items for families that reflect Christian values. 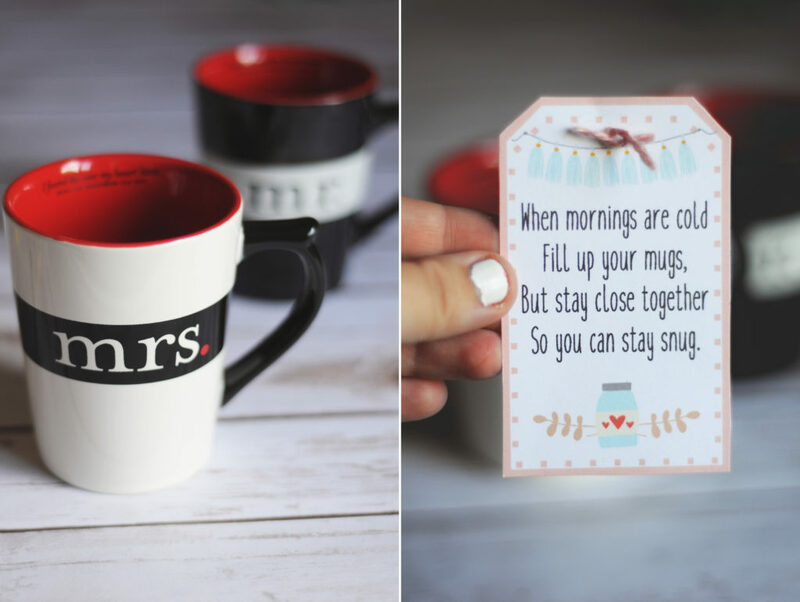 A great example are these adorable matching Mr. and Mrs. mugs pictured below. Inside the rim there is a little quote, ” I found the one my heart loves. -song of solomon 3:4 niv”. It so sweet and subtle it was perfect for my newlyweds couple. 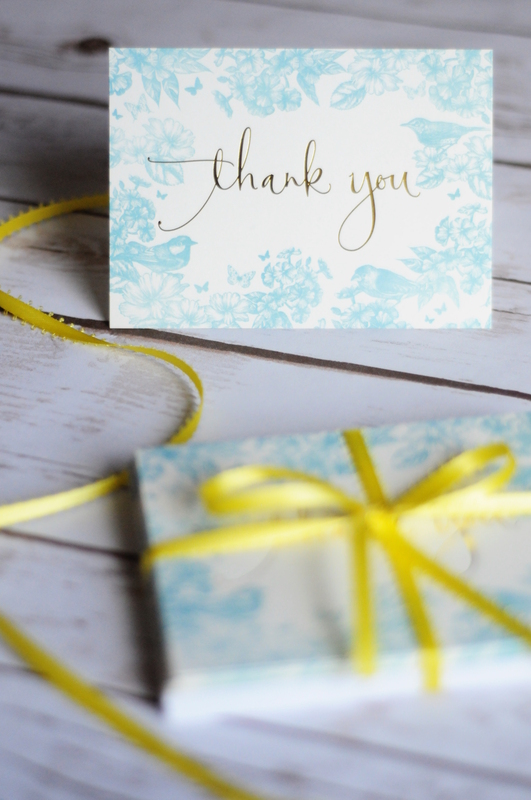 Also check out this super cute set of thank you cards that I include with their “stationery” items. I jazzed it up by adding a little yellow ribbon, also found at Walmart an aisle or two away… seriously, putting together this basket is a breeze when all the items are in the same place! 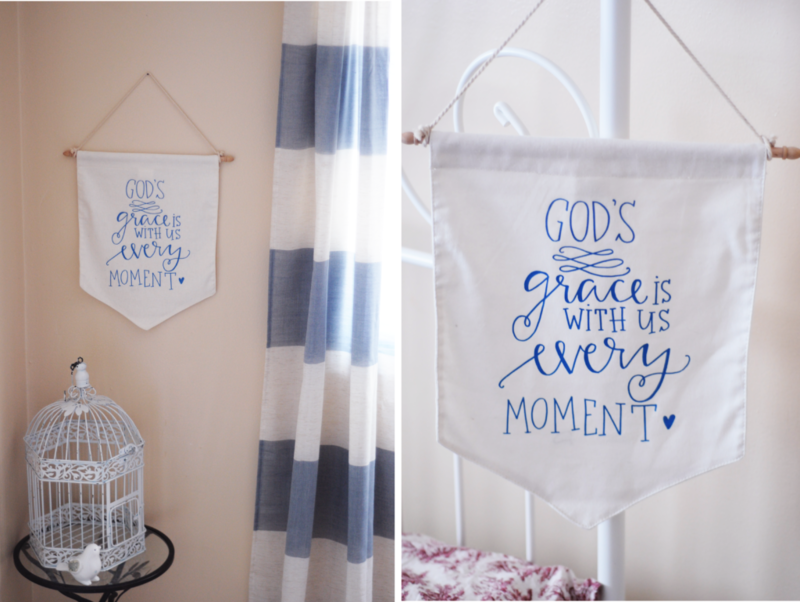 For the basket’s home decor item I purchased this banner, also from the Christian Celebration products. I loved it so much I had to buy another one for myself. I feel like sometimes it can be hard to find stylish home decor items that reflect Christian values. I’ve been seeing a trend in decorative banners like this one and love the simplicity and focus on the quote that makes this piece so versatile. It’s always great to a have a home decor item that can be placed in any room in your home and feel like it belongs. There are a quite a few other products in the Christian Celebrations line at Walmart that would work great for your newlyweds gift basket or even just for your own home. 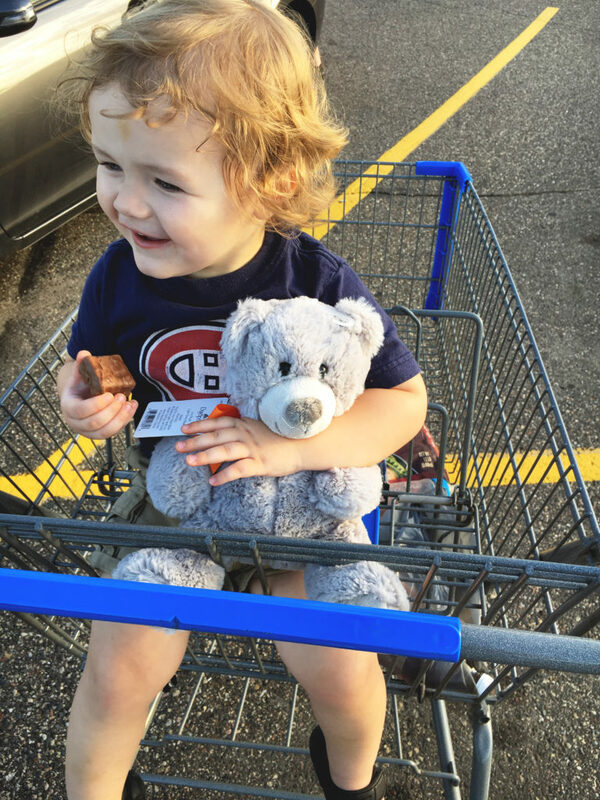 My two year old son even found something he couldn’t go home without, a new teddy bear. You will want to check if your local Walmart carries this new line, as it is not located at every location. You can find out by going to dayspringchristiancelebrations.com. You can also visit this site for inspiration and ideas as well as contest information. When you purchase any of the Christian Celebrations products share how you’ve used them in your own home, office, or as a gift on Instagram for a chance to win a prize package from Walmart with a retail value of $40! This is the perfect contest because you’ll already have something adorable for yourself or a loved one, simply share your inspiration with others using the hashtag #christiancelebrations and #Walmart by September 12, 2016 for a chance to win! If your local store sadly doesn’t carry this line, you can still enter for a chance to win by sharing a fun way to decorate while living your faith or items you would sent to a friend or love one. Now don’t forget the final item for you gift basket, the gift tags! Click above to download your free printable gift tags. Once downloaded you will see that there is a blank set, incase you want to create your own wording, and another set already filled out. There are 4 tags per sheet. The wording on the tags included are applicable for a matching mug set, home decor item, stationery, and a bottle of bubbly (alcoholic of otherwise). The wording is generic enough that you do not need to purchase your items from Walmart’s Christian Celebrations line. However, it sure does make it easy having everything you need in one place. And like i’ve already stated, I think their home decor items are adorable so why wouldn’t you!